This is a collection of ghost stories by the author, editor and natural historian, William James Wintle. A prolific freelance writer, Wintle was later Oblate (that is, a lay brother) of the Abbey of Caldey Island, off the west coast of Wales. It was here that he composed these fifteen tales for the entertainment of the boys who attended the Abbey school. Although written for children, the tales in this varied collection remain entertaining for a modern audience and are notable for the variety of the phenomena evoked – from the ghost of a woolly mammoth to a fearsome attack by a Romany werewolf. 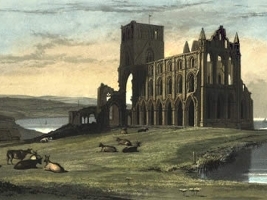 Note: the painting above is of Whitby Abbey. There is no connection between Wintle and that abbey – I have chosen the picture simply because it seems to me to capture the atmosphere of Wintle’s stories! This entry was posted in Ghost Stories, W.J. Wintle (1861-1934), Werewolves and tagged abbey school, antiquarian, books, british, caldey island, download, ebook, epub, free, free ebooks, full text, ghost gleams, ghost stories, ghost tales, kindle, literature, natural historian, pdf, text, wintle on June 28, 2013 by stylesofdying.